The IDTechEx Show! on April 10-11 in Berlin brings together eight key disruptive technologies and their customers at one venue. Industry analysts from IDTechEx have invited global speakers from many end-user organisations in addition to technology developers discussing their latest breakthroughs allowing you to gain actionable business insights and meet potential customers and partners. 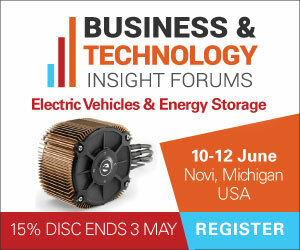 Among over 250 speakers, themes covered include the disruption in the emerging electric vehicle and energy storage industries; opportunities in healthcare applications from wearables to biosensors; innovations in consumer electronics including flexible and foldable displays; manufacturing innovations - from additive printing to structural electronics; and new materials advances, from thermal interface materials to stretchable electronic materials. Covering these topics we have a superb line-up of end-users discussing their requirements and activities in bringing these technologies to market. Speakers include: AbinBev, BEKO R&D, Bosch, Boston Scientific, Continental, Daimler, Diageo, Google, Microsoft, Mitsubishi Electric, NREL, Panasonic, Qualcomm Life, Renault Trucks, Samsung, Schreiner Medipharm, Siemens, Sony, US Army, UTRC, Visionox and many more. For the full list of speakers click here. Matching applications with the appropriate technologies is the focus of the event, which aims to speed up the adoption of these technologies. Over 200 exhibitors will showcase their latest solutions and advancements in the areas of 3D printing, electric vehicles, energy storage, graphene, IoT, printed electronics, sensors and wearable technology. The event is hosted by IDTechEx, the global advisory and business intelligence research firm, which focuses on providing impartial market and technology assessment to clients. IDTechEx analysts construct the agenda and cherry pick the leading speakers from around the world to ensure that the latest trends and opportunities are aired for attendees, providing valuable insights. Register now for the early bird discount ending February 15th, 2019 at www.IDTechEx.com/europe.